You can read my review of the first in this series here, and the third here. Where did I get it? The library, must remember to take it and the other one back! What's it about? Hazel is spending the holidays with Daisy's family at Fallingford, and it's also Daisy's birthday. 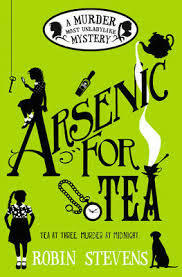 Kitty and Beanie, their school friends, arrive too, as well as Uncle Felix, Aunt Saskia, and Mr Curtis, who is a rum sort, and who ends up murdered through arsenic poisoning. The Detective Society, with two new assistants in the shape of Kitty and Beanie, start to investigate - even though Uncle Felix wants them out of the way and their governess Miss Alston is acting strangely. What age range is it for? 9+, as the others. Would I recommend the book? Yes, these are really cute books. I've already pre-ordered the next which is out next March! Where is the book going now? Back to the library!